Here is popteen may 2010 issue again features Kumicky..kumikki which ever way she spells her name in english hehe... :p now she collaborates with sanrio and have her own Hello Kitty after her!! Tsubasa Masuwaka 益若つばさ the creator behind Dolly Wink, one of the most popular gyaru model right now who graces on from magazines, products and is a tv personal. She is very successful entrepreneur. new canmake addition milky jewel eyeshadows :D it say the shimmer wont fade and its waterproof,, sounds interesting. Love the scans - :) It is always so fun to look through and see the different styles & get inspired! Good luck on the hunt for cute boots! They don't have to be authentic, but it is nice to have leather since you know they will weather nicely and last longer. Mmmm...your kit kats blogs are inspiring bloggers all over the web, myself included! 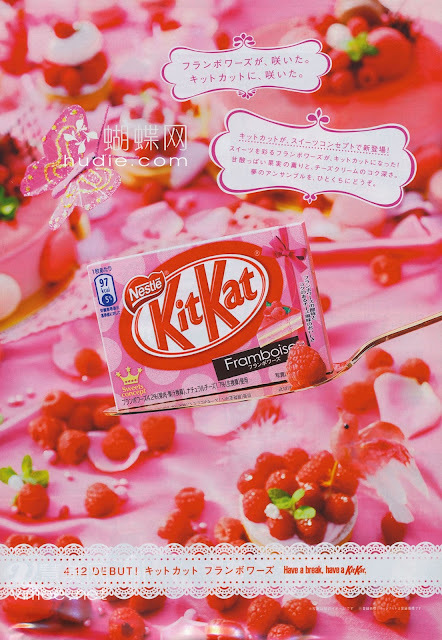 :) The framboise looks soooo delectable! 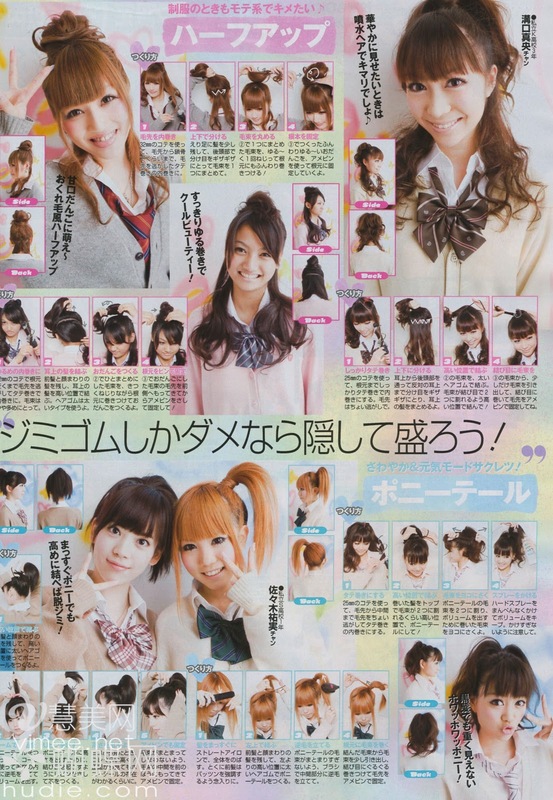 Those schoolgirl hair dos are super kawaii! Makes me wish that I could wear cute looks like that! thanks so much for sharing! : ) is it okay with i post these on my blog as well? of course i'll give credit back to you?! 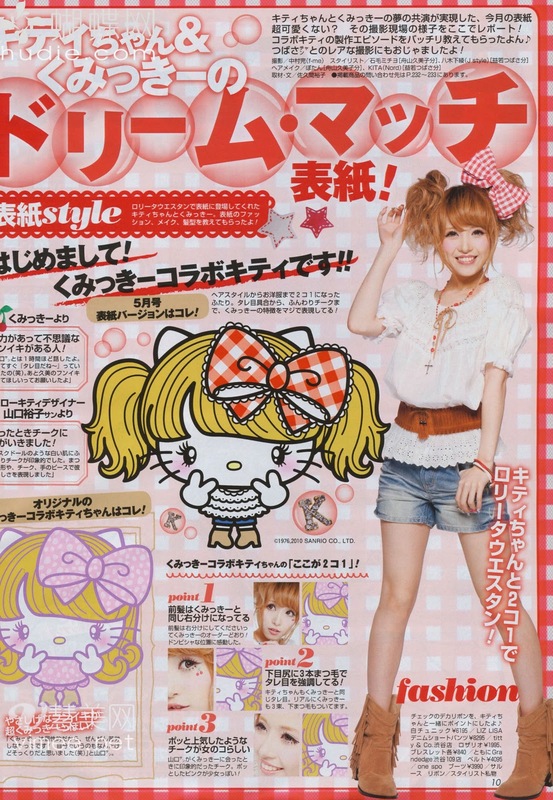 Omg...I love Japanese magazines. So colourful and cute! I wish I know how to read Jap now... I must learn that language! Lol. omg thanks so much for uploading! Big Spring Contest: You want a unique skirt to show your beautiful legs this spring? This contest is for you! 1) Draw the skirt of your dreams followin the theme "skirts, dreams and candies for spring"
2) Leave me a comment with the link of your creation + your name + you blog. 3) Make pass the word! If the contest gets 15-20 cantestants, the winner's dream will come true: I will sew her skirt and send it to her. Hi Eki! I'm Ligaya from the Philippines, and I found you through hopping from one gyaru blog to the next. So the next big trend, according to Liz Lisa and Popteen, is rustic country cowgirl? Man that makes me miss my pink and white cowgirl boots! They were my size and very lovely, but the tropical weather of my country got to them. T.T Would you know how girls living in the tropics (like Southern California, the Caribbean, Indonesia, Malaysia, Vietnam, Singapore and the Philippines) would best take care of and keep their boots for years? Also, just a question on the make-up in the magazine spreads here: is it safe to say that you either use a white or pale-colour eyeliner and then put on the mascara generously, or even skip the eyeliner at all? It gets REALLY HOT AND HUMID OUT here where I live, making layers of make-up impractical, hot and pimple-causing, so I would like to be able to come up with a similar effect like the make-up of the girls in the Popteen magazine, without worrying about "runny" eye make-up.